Picasa Web Albums is the online photo album, photo storage and photo sharing service from Google which is integrated with Picasa, a popular yet free photo organizer and photo management tool from Google. The main feature of Picasa Web Albums is the ability to upload directly the photos from Picasa to the Web Albums with just a single click on “Web Album” button, together with album titles and descriptions which can be easily change later, and get human-readable URLs for sharing. 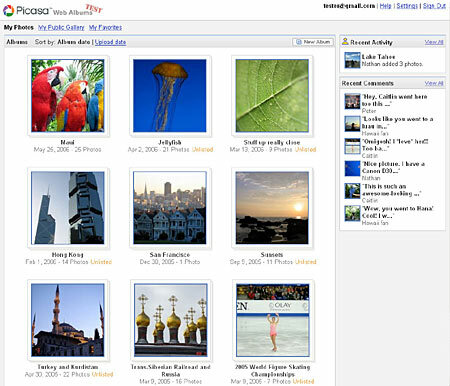 Picasa Web Albums is currently available by invitation and it’s for Gmail users only. If you get the invitation and sign up for Web Albums, you will be prompted to download a new version of Picasa with the “Web Album” button. However, Picasa is not a necessity to upload the photos to Picasa Web Albums. You can create a new and multiple albums and upload the photos via the web interface. All Picasa Web Albums comes with 250MB of free storage space, and with $25 a year, you will have additional 6GB of photo storage space. All uploaded albums and photos are automatically shared. The 2 settings that currently available for the photos are public and private (“unlisted”). Public will makes the photos into the user’s public gallery and available to anyone who knows the Gmail account under which the photos listed, and private (“unlisted”) will make the photos available only to those with a special link that the Picasa Web Albums users shared with. However, whoever get the special Web Albums link will be able to access the albums or galleries too, and currently there is no way to password protect the albums or make the Picasa Web Albums account completely private. On the Picasa Web Albums web interface, users can easily email friends and family the links to individual photos, albums or galleries online by clicking on the “Share” button. Or you can simply give out your public gallery URL which will allows access to all your public albums. (Note that public gallery link address can be changed to hide your Gmail address). There is also a “My Favorites” tab which allows users to list links to friends’ Web Albums. Viewers need not be a Gmail or Picasa Web Albums users to view the albums. Picasa Web Albums also allows you and other Picasa users (if allowed) to download photos or entire album at at 1,600-pixel resolution back to your computer Picasa galleries in 1 click with Picasa photo organizer and download individual photo without using Picasa software. Viewing photos in Picasa Web Albums is optimized so photos look as good on the web as they did on your computer, which are big enough to fill the largest screen sizes and fast to scroll through. It’s also possible to zoom in for larger view or closer look, or view the photos in a web-based slideshow. Other features of Picasa Web Albums include adding photos, ability for viewers to post and view comments and navigating through the images simply requires scrolling with the arrow keys. A “recent activity” section shows recent photos uploaded by friends. Uploaders can even manage the photos and albums online, including rotate the photos. Upload and share your photos at Picasa Web Albums.